This post was written by Ricardo Schäfer, from Seedcamp’s Investment Team. Follow Ricardo on Twitter @schaeferric. In the US, you will undoubtedly find some of the best Venture Capital firms in the world. Funds like Sequoia, KPCB, Greylock, NEA and DFJ have financed the rise of Silicon Valley as the leading startup hub for global high-tech innovation and have backed some of the most successful tech companies of the past 30 years. For startups, an investment from a renowned US VC brings a number of advantages over other sources of funding. US funds often leverage extensive operational experience, connections, and support functions to assist their portfolio companies. For this reason, they are often labelled as smart money. 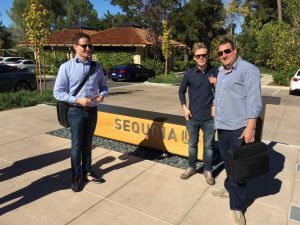 The team was recently in the US for our bi-annual trip with Seedcamp founders. Visiting New York, Boston, San Francisco and Silicon Valley. One of the key points European founders need to be aware of when seeking to fund from US VCs, is that they predominantly back US companies. Of course, there are exceptions, like Peter Thiel’s New York-based Valar Ventures which mainly invests outside the US (for example in Seedcamp’s own, Transferwise). Fred Wilson’s recent blog post about investing in Europe also indicates increasing appetite for leveraging the valuation discrepancy between the US and Europe. Overall, US investments outside their own territory are rather the exception than the norm. So is it even worth pitching in the US as a European company? How can European founders increase their chances of receiving funding from a US investor? What are those funds actually looking for? 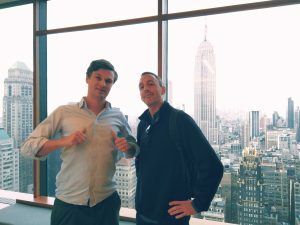 I’m responsible for organising Seedcamp’s biannual US trip across New York, Boston and Silicon Valley, so I was keen to compile a number of useful criteria European founders should consider before pitching in the US. About a third of Seedcamp’s portfolio companies have raised from US investors, so it’s important our founders understand the relationship and how to increase their chances of success. Below are questions to consider when actively looking at US investment. Are you willing to move to the US or enter the US market? If you’re not planning on entering the US market, it may make sense to stick to local VCs. The reason for this is that many American VCs avoid investing outside the US. Common reasons include the difficulty of evaluating the European (or local) market and limitations around being able to add value as an investor or even exercise control. If you want to increase the chances of an investment you should, therefore, state a clear plan on when, why and how you will move to the US. This is particularly true for earlier stage companies. Do you have the potential to become a $bn dollar business? A lot has been written about fund economics and the necessity of billion dollar exits in order to return a fund. Investments in companies that are more likely to exit below $100m are irrelevant for the performance of any significant fund. Venture firms managing hundreds of millions of dollars are therefore looking for startups that have unicorn potential. Size matters, and the question of “how big can this be?” is going to be one of the most important ones European founders need to address as early as possible in their pitch. This is particularly true for a large number of US funds often managing a lot more capital than their European peers. Always make sure you talk about your long-term vision for the business and why your company will be big! If you do not believe your business is going to be another unicorn then consider that US VC funds may not be the right fit. Are you building something customers care about? European VCs generally tend to be more metrics-focused than in the US, which is probably one of the few places in the world where founders can raise a substantial amount of money without any kind of traction or even an existing product. Note this is during the bull market for investing. However, this is only true if you can convince the investor that you are building something customers truly care about and the market is big enough. This customer-centric perspective is particularly important in the US, and whatever business you pitch in the States you have to make sure you explain why customers will want to have your product. Do you understand the US market dynamics? – Who is your biggest competitor in the US? – What does your typical US customer look like? – What’s your sales process and sales cycle in the US? – How do you arrive at your price point? How much do you charge your US customer? – What’s your total addressable market size and how much of this is in the US? Make sure you have good answers on these questions when you pitch as you will look a lot more credible, in particular if you have said that you are planning a move to the US. In the US, there is a view that the entire tech ecosystem is connected and that personal relationships form a critical component of success. Good investors are therefore generally open to helping founders they are not going to invest in. Be sure to do your research in advance and ask for introductions or advice when you pitch. You will be surprised by how much more helpful American VCs can be compared to their European counterparts. Ultimately, it’s of course not the geography or the reputation of a fund that you should seek. Regardless if the fund is European or American, what you will want to have as a founder is a VC that shows commitment and can add value to your business. Make sure you’ve done enough research on the individual investors you are pitching. Check out our podcast series, which includes interviews with US VCs, and, of course, try to speak with portfolio companies, your network and fellow entrepreneurs to be best prepared. Even if your fundraising trip to the US has not been immediately successful, you’ll find that coming back to Europe your pitch has dramatically improved and you’ll have better chances of successfully raising funds at home. There is an increasing number of great European VCs, so unless you’re moving to the US, or believe your business is in the top 5-10 per cent of European startups, the US might not be the right place for you to seek funding. But once you have spent some time pitching in the US, those new relationships will put you in a great position to return to pitch for your next round. 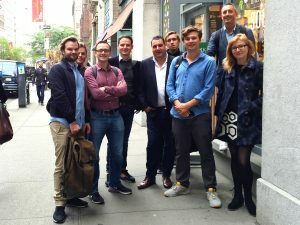 To keep up to date on the latest news and thoughts from Seedcamp, follow us on Twitter and Facebook.